I went to a wedding in Davis a few weekends ago. It was lovely, and just about as lovely as the ceremony was the ease of getting to and from Davis from San Francisco by Amtrak. I biked to the Ferry Terminal to pick up the bus that took me to Emeryville to catch the Capitol Corridor. I brought my folding bike because I thought it would be practical, but it turns out you can really bring any kind of bike on Amtrak and hang it on these designated bike racks. I hate wearing heels period, so I changed from my Chucks to my dress-up shoes once I got to Davis. My hotel was 2 blocks from the train station. I stayed at the Hallmark Inn in downtown Davis. 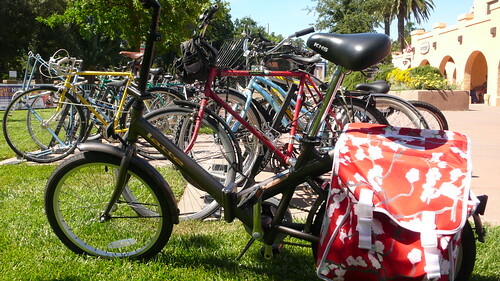 Again, I thought bringing my own bike to Davis was so practical, but it turns out that the Hallmark has a whole fleet of Globe bikes for their guests to cruise around bike-friendly Davis. I fit everything I needed for the weekend getaway in my Basil panniers. The Latte likes being a tourist! 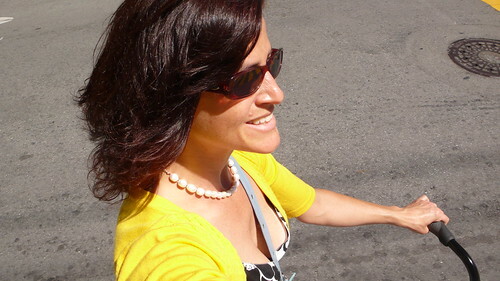 And if you haven't had enough video of KT riding around in SF, here ya go (sans vuvuzela)! Fun! 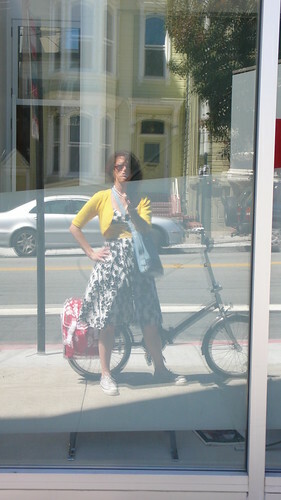 I often took the train in the other direction, from Davis to SF (with bicycle of course). Lovely, stress-free train ride. I miss NorCal! 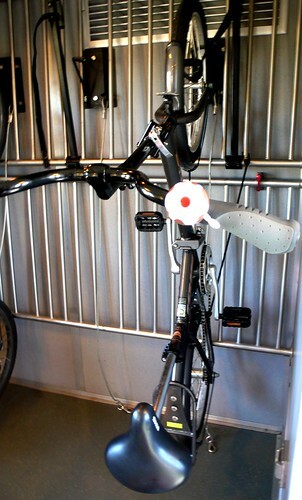 Thanks for posting the picture of the bike rack in the train. I've been considering a train trip, but wondered how bike-friendly (or not) Amtrak might be. Yes, it was easy and very bike-friendly. And Davis does seem like the Copenhagen of California. I was looking forward to the train ride as much as the wedding itself! Wihoo! Wow. I want to take Amtrak somewhere soon and take my bike. What kind of folding bike is that? It's a KHS Latte single speed. It's cute and very upright so very comfy, but not very fast and kind of heavy! Not the greatest folding bike for a big traveler. I wouldn't bring it on a plane with me, so I'm considering selling it for something lighter and with more gears. 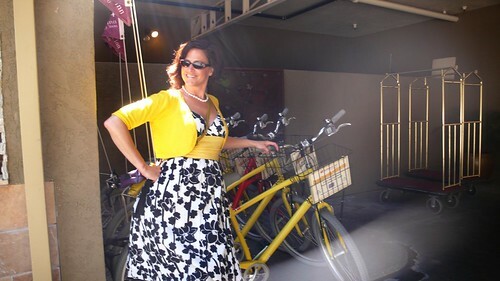 What a great way to travel, love that you did that and looked smashing while at it! S.
Merci beaucoup! And I'm gonna do it again and again! It is a close call. Portland, of course, is a much larger city and Davis is a low-key college town. The "bike cultures" in both towns seem very different to me because of the populations that live there. 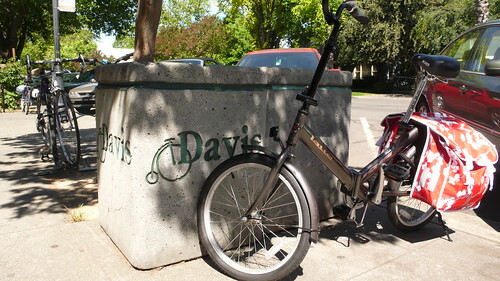 That said, it seems like the City of Davis adopted the bike as its mascot. hi.These looks nice. pictures is also good. Thanks.